In today’s world, full of Google Homes and Amazon Echos, people no longer search the internet solely with typed queries. Comscore estimated that 50 percent of all searches will be voice searches by 2020. If you haven’t already, it’s time to acknowledge voice search for the powerful change that it brings. It’s a total game-changer! 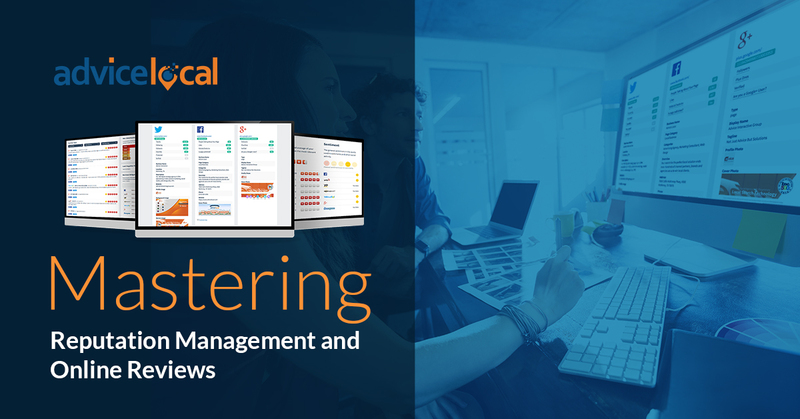 Over one billion voice searches are conducted every month – are you optimizing your clients’ websites for that level of popularity? Now is the time to figure out what voice assistants and people using voice search are looking for via search engines. If a local business is not answering the public’s questions correctly, then they’re not outranking the competition. But don’t worry! 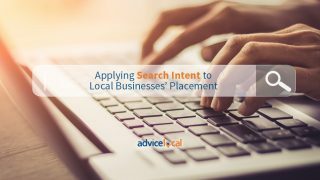 At Advice Local, we won’t let your local business clients lose potential customers to the competition. 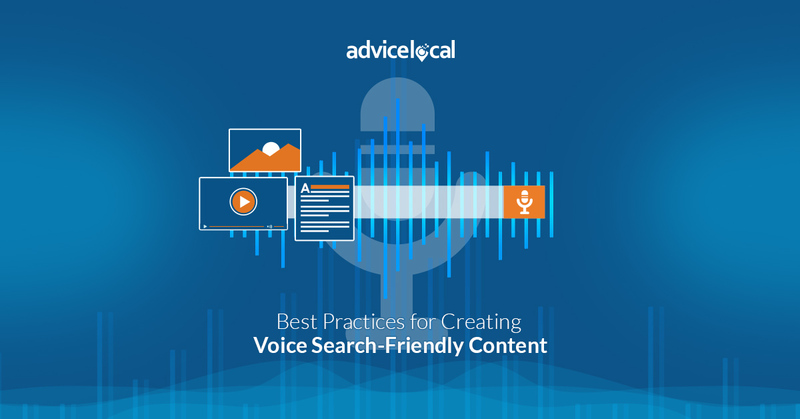 There are certain things to keep in mind when producing content to fit the ever-evolving needs of voice search. 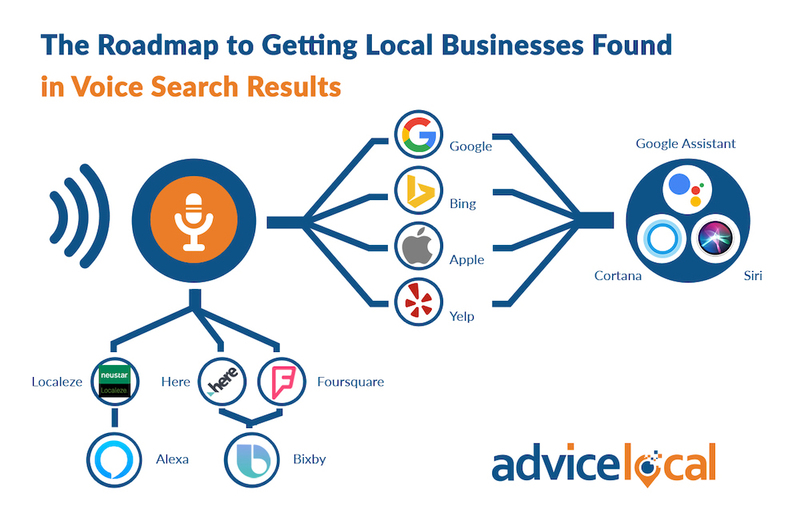 I know I’ve mentioned some of these before, but as voice search is evolving so are the steps you need to take to help local businesses get found. Long-tail keywords are exactly that: long-tailed; they are longer than regular keywords. For instance, a long-tail keyword might be “plumbers in the St. Louis area” while a short-tail keyword might be just “plumbers St. Louis.” If businesses include long-tail keywords in their content, they will not only appeal to more readers, but they will also find themselves more on voice searches. Think about it this way: old searches were awkward and short, but new voice searches are longer and more natural. Therefore, content needs to become more conversational, too. 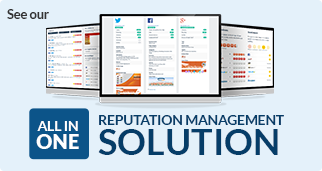 Businesses should keep it simple and avoid jargon that might not rank well with searches. The voice search generation isn’t just looking for answers; they’re looking for answers now. They expect to see results within seconds, and more often than not, they’re turning to the top Google results. That’s why the featured snippet is so incredibly important. It’s the highly sought-after holy grail of search engine placement. You’ve seen featured snippets more times than you can count at the top of a Google search. It’s the blocked-off, emphasized answer to your question, usually stemming from a detailed FAQ page or an authoritative blog. The answer is straightforward and to the point, which makes finding your results easier than ever. Desktop and mobile searches aren’t the only ones highlighting this featured snippet. When someone conducts a voice search, Google will almost always reply with the featured snipped as the only answer. According to digital agency ROAST, a whopping 80 percent of the answers given by the Google Assistant come from featured snippets. Therefore, the more featured snippets a business can snag, the more often their content will appear in voice search results. Don’t you love that? I sure do. 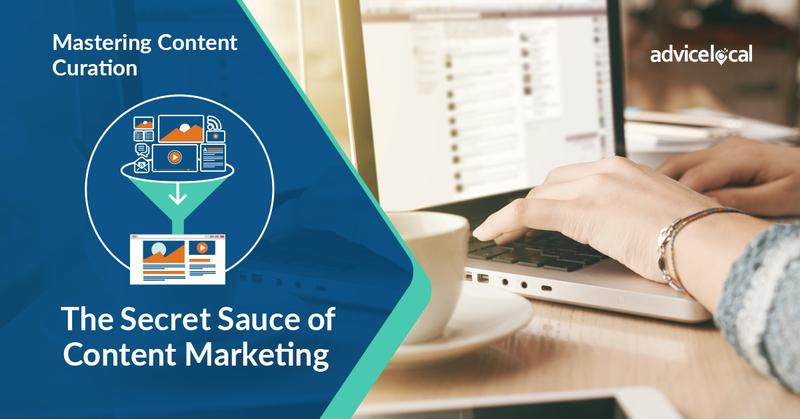 As you know, businesses should keep their blog posts and other content concise, easy-to-read and on-topic for a chance to win that featured snippet. They need to think about the questions people ask, then address them in the most useful way possible. One way to find the questions people are asking is to run a Google search for a keyword and then see what other questions show up as suggestions. 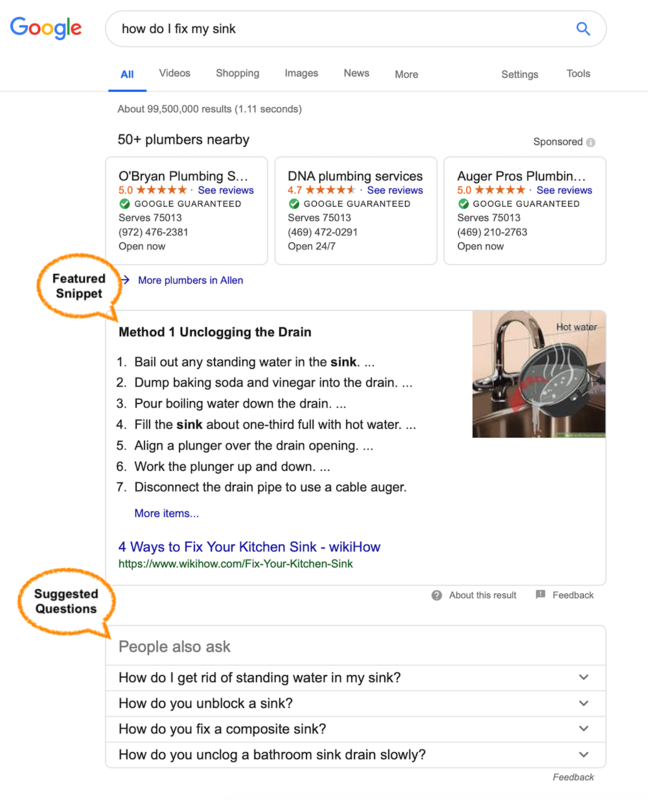 In the below example when I searched “how to fix my sink” the featured snippet went to a wikihow article and below that was a series of “People also ask” questions. These are potential questions people could ask in a voice search or, for that matter, in a desktop search. Including these questions in a business’ website content is a no brainer. A huge chunk of voice searches center on local queries. People are way more likely to ask their phone “where’s the nearest sushi restaurant?” than they are to conduct thorough research on a topic. They want answers quickly, and these answers need to be locally relevant. 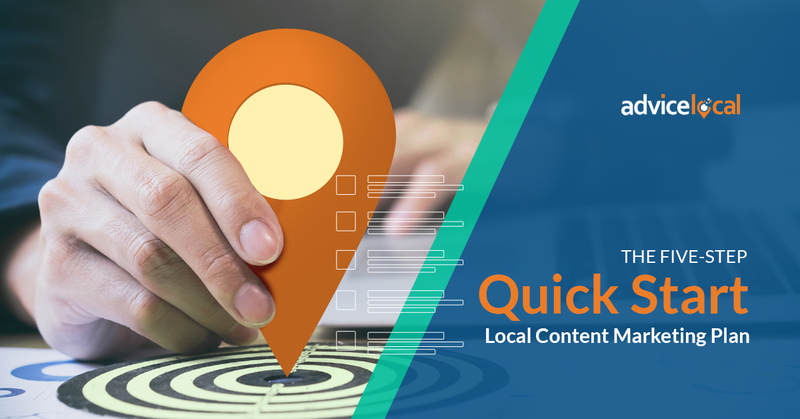 That’s why updating a local business listing with the correct phone number and hours is a vital part of optimizing for voice search. In many ways, voice search and local businesses are a match made in heaven. Voice search looks for easy, close answers, and local businesses feed off the queries of nearby people who use voice search. 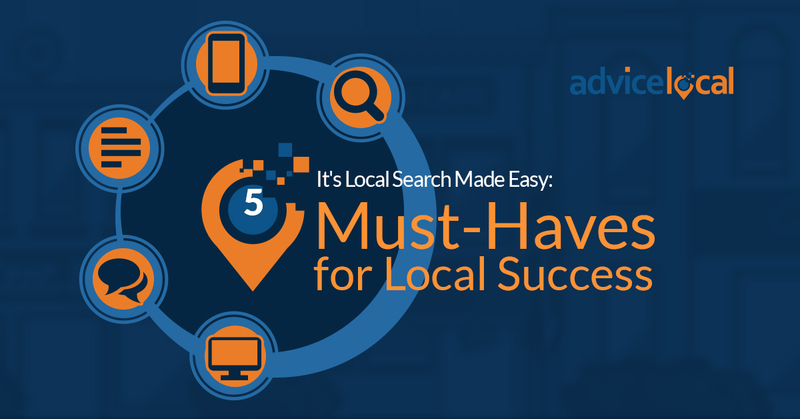 We have the roadmap to getting local businesses found in voice search. Not convinced? 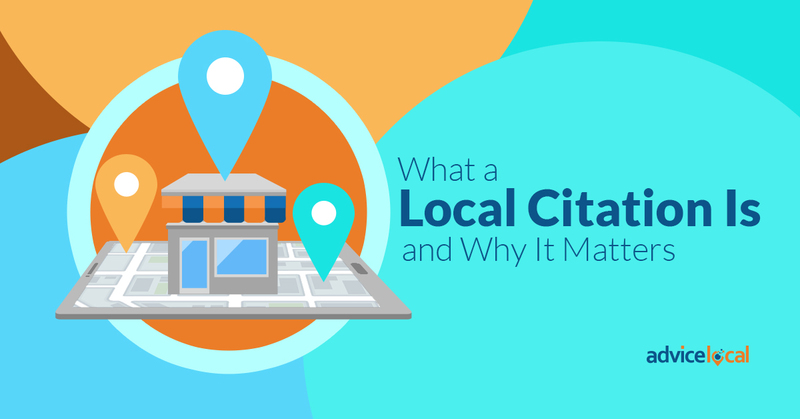 As BrightLocal pointed out in their Voice Search for Local Businesses Study, 46 percent of voice search users look for a local business on a daily basis. If a local business isn’t optimizing for voice search, then it’s missing out on a bunch of potential customers. According to Stone Temple Consulting, people between the ages of 25 and 34 are becoming increasingly comfortable using voice search in public, and you know what that means: they’re using their smartphones to do so. Many of these searchers will visit a website after conducting a voice search, so the website must be optimized for mobile viewing in order to impress visitors. Clunky text instantly turns people away. Most importantly, the website needs to load quickly on mobile (and desktop too), plus give readers what they’re looking for right away. 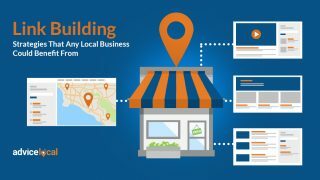 Local businesses can increase their chances of converting a potential client by providing accurate information the second they access the business’ website. Additionally, the site should be clean-cut and purposefully laid out. As a reminder, the Mobile-First Index decides placement for a website’s pages in desktop and mobile search for a pretty big chunk of searches today. One way to make the business’ mobile website extra friendly is to include an easy-to-find FAQ page. This is where the searcher can access basic information, such as the business’ hours, address, prices, services, etc. Here are some additional tips and tests on how a business’ can check the mobile-friendliness of their website. I can tell you right now that voice search isn’t just a passing trend or something for the young folks. Search engines and their algorithms are always changing, and as far as I can see, voice search is the present and future. 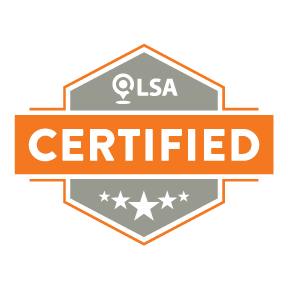 It’s so important that I created a voice search guide to help you through the journey, and developed the first-of-its-kind Voice Search Readiness algorithm. When optimizing a business’ site for voice search, don’t just think about the here and now. 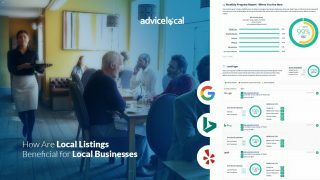 Find out how we help local businesses get found in desktop, mobile and voice searches every day – request a demo today.